Current scientific literature, as well as a long history of use in traditional healing, supports the use of chastetree berry to help put the female hormonal system back in balance. Calcium lactate is the key ingredient in NutriPlex Formulas’ CalMag because it is the least irritating and most effective form of calcium you can give your body. Here are the the top 4 benefits of calcium lactate. We need help breaking down fats like oils, butter, grease, and lipids. When we can’t properly process these substances, common symptoms occur including gas pains, indigestion, blocked arteries, and more. Wild pansy is a vital ingredient in our Caro-C supplement because of its ability to strengthen blood vessels, improve skin health, and protect against disease. The nutrient complexes in beets are full of essential B vitamins, proteins, and antioxidants that support many vital body functions. When there’s a listing of milligrams on a nutritional supplement, it means the nutrient you’re looking for was either extracted (or “isolated”) from a food or, even worse, made synthetically in a lab. Clinical use of bovine adrenal glands by nutritionists have made clear their positive effects on the human adrenal system. 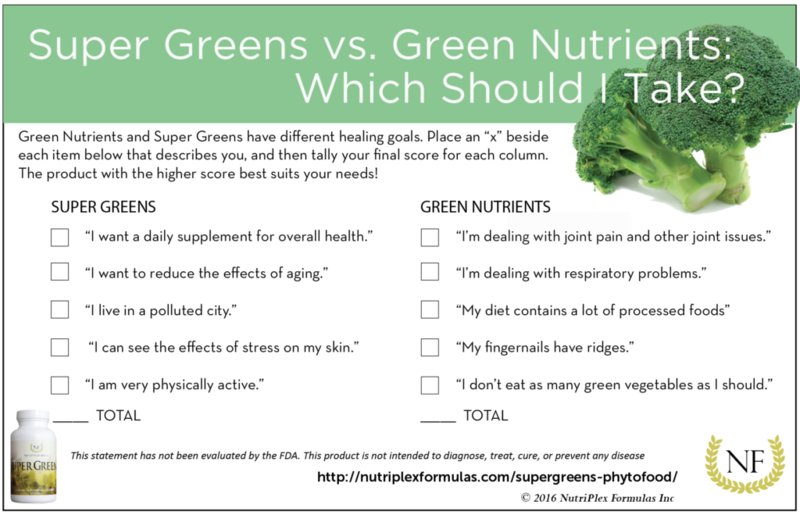 Super Greens vs. Green Nutrients: What’s the Difference? While Green Nutrients and Super Greens have some benefits in common — such as supplementing diets lacking in green minerals — their purposes are unique. NutriPlex Formulas’ Super Greens contains 18 nutrient-dense ingredients, designed to support, rebuild, and strengthen every system in the body.